Nothing tells the story of the evolution of clean energy in America quite like a historic gas station in Modena, N.Y., that’s now a place where you can charge an EV or buy solar panels for your home. 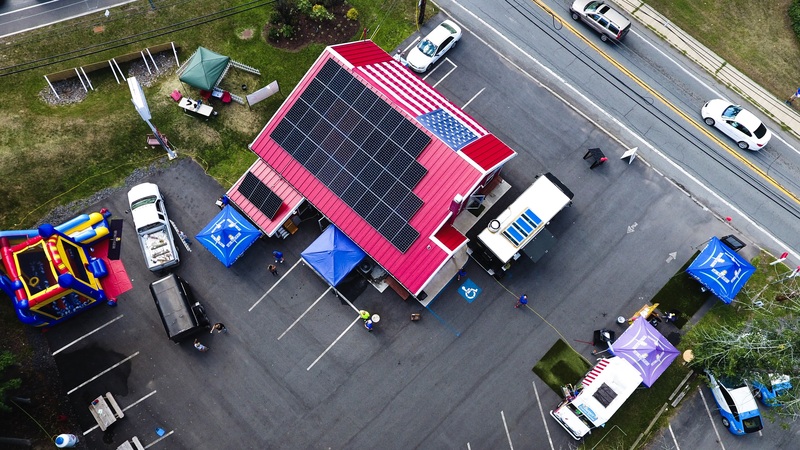 The 1960s-era building, where the Big Save Gas Station was once located at the intersection of Routes 44 and 55, was renovated into SunPower by New York State Solar Farm’s Solar Design Center, a place for local residents to learn about switching to solar energy. The gas station is at the center of the community, where holiday parades march by, but had fallen into disrepair and become an eyesore. But after the 2014 remodel, topped off by a you-can’t-miss it coat of fire engine red paint, it’s now a point of pride. Sicari and his team purchased the building in Modena’s historic district in 2005. When they embarked on the remodel, they kept the gas station footprint, keeping the original walls and garage doors. They installed a filtration system to sop up residual oil in the ground, made sure materials were properly recycled and had onsite air and water inspected for purity. The original gas pricing kiosk is still out front, but it no longer lists those days-gone-by .36-a-gallon gas prices, of course. Instead visitors can compare local electricity rates with the .11-cent rate customers can lock in when they go solar with SunPower by New York State Solar Farm. Local research revealed that the gas station was originally built in the early 1900s as a farrier shop, a place where travelers on horseback could stop for help with horseshoes. One of the horseshoes is framed on the wall of the revamped building in homage to its history. SunPower’s network of elite dealers all over the country have been opening Solar Design Centers, places where community members can learn about going solar with a locally owned business. The Modena design center has an approachable feel. Anyone is welcome to stop by and see SunPower solar panels up close — touch them, inspect them and learn how they work. A monitoring system displays the real-time energy production from the center’s own rooftop solar system. “People can look at that and say, ‘Wow! We're producing more than we’re consuming in this building.’ People really get a kick out of it,” says Sicari. It’s not a hard-sell environment. The focus is on educating people and seeing live demos. What was a blemish is now an eye-catching beacon for solar energy. Customers and passersby marvel at the transformation and thank Sicari and his team for preserving the building. SunPower by New York State Solar Farm is a people-centric business with a unique family feel. Even with all their advanced tools and educational events, Sicari says the connection between team members and the people they interact with is what really sets them apart. With nearly 2,000 residential solar installs in the Hudson Valley, the team is proud to be a part of the growing solar community as they expand from Westchester to Glens Falls and beyond. If you’re looking to buy solar panels in New York, stop by SunPower by New York State Solar Farm’s bright red historic office to see what you can get when you go solar with SunPower, including high efficiency panels, an industry-leading warranty and flexible solar panel financing options (purchase, loan or lease). Want to find a SunPower Solar Design Center in your area? Click here for a zipcode locator of SunPower dealers near you.